A new holiday exhibit, “Santa’s and Sleighs,” will be featured at the Mitchell County Historical Museum. The exhibit has been created in memory of the late Jon Witt and in honor of Richard Lunde, who for 40 years played Santa Claus for local and area children. On display will be the Witt family antique cutter sleigh, which was recently refurbished by Jon Witt’s daughter, Linda Kuehne, and Phil Kolbet. A mannequin with Lunde’s Santa outfit will be on display, as well as Keith and Marlene Ham’s Santa Claus collection. The 100 pieces and artwork were gathered by the Osage couple on their world travels. Artist David Rottinghaus will also exhibit his original Santa and Sleigh painting. Other Mitchell County collectors and artists will also be featured. The Witt sleigh will be the featured item as visitors enter the museum. Kuehne said the sleigh was a “treasured possession” of her father. 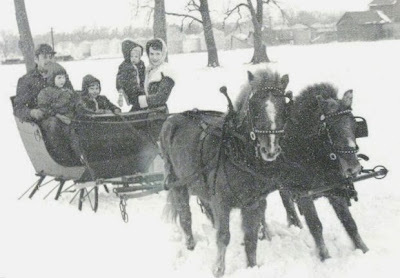 She and her siblings enjoyed many sleigh rides as children, she said. cover of “Successful Farming Magazine,” with Witt and Kuehne’s daughter, Jacey. Roy Lumholt did the restoration. Kuehne noted how much her father enjoyed the historical society, and served on the original planning committee for the construction of the Cedar River Complex. Copyright 2013 Mason City Globe Gazette. All rights reserved. This material may not be published, broadcast, rewritten or redistributed. Linda Witt Kuehne sits in a favored possession of her late father, Jon Witt. 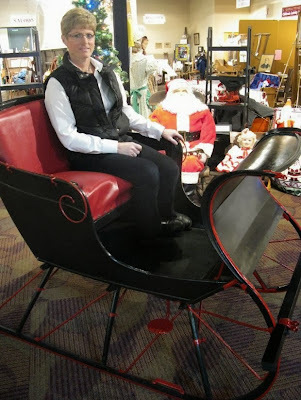 The sleigh will be one of the featured items in the Santa's and Sleighs exhibit at the Mitchell County Historical Society.